We all know you can’t really train a cat to do anything. But if you present an idea the cat likes, she just might go for it. So when you look at it that way, learning how to walk your cat on a leash isn’t that hard. After all, most cats really like the idea of going outside. Our step by step guide will show you how to walk your cat on a leash. But remember, every cat is different. So you and your cat might decide to skip some steps, or add some. Think of learning how to walk your cat on a leash as a joint effort. She’ll probably be training you as you’re training her. And keep it fun. If walking on a leash seems like something she wants to do, she’ll get the hang of it in no time. If it feels like too much of a project, she’ll decide she’d rather just curl up on her favorite chair and take a nap. A secure harness. Most cats hate things that slip over their heads, so choose a harness that straps or buckles around your cat’s neck and middle. Never attach a leash to her collar. Break-away cat collars are designed to come apart under pressure. 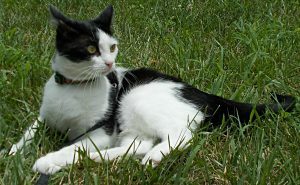 If your cat pulls on the leash, the collar could come undone, and she’ll be off and running on her own. A leash that’s at least six feet long. Although retractable leads are not safe for dogs, I love them for cats. They give kitty lots of running room. Treats, lots of treats. You’ll need them to provide incentives, rewards for a job well done and as a thank you for putting up with you when your cat starts to get annoyed. 1. Leave your cat’s new harness beside her food dishes or favorite bed for a few days so she can get used to seeing it and it can absorb your home’s familiar scents. 2. Try putting the harness on your cat. This might take some getting used to since cats come fully dressed and aren’t accustomed to wearing extra things. You might have to lay the harness on the cat’s back and let her get used to that before you try closing it. Give her treats to eat while you’re putting the harness on. 3. Attach the leash to the harness, and encourage your cat to walk around the house with you. As an incentive, put some treats a few feet away from her. This is where we come to step one in cats leash training humans. Follow her wherever she wants to go. Let her guide you instead of you guiding her. Some cats lie down the first few times they’re wearing a harness and leash. Don’t give up! She’ll get the hang of it eventually. In the meantime, give her some treats when you take the harness off as a thank you for her patience. 4. When she’s comfortable in her harness and leash, it’s time to walk your cat on a leash outside. Open the door and invite her to go out with you. Put some treats just outside the door. She might decide that she’d rather stay in and just sit at the open door. That’s fine. If you invite her to join you outside often enough, she’ll eventually decide to give it a try. Meanwhile, she deserves some treats every time you go back in for watching you standing in the yard all by yourself. 5. Leave the door open the first few times you go out. Your cat won’t be frightened if she’s sure she can get back inside. I’ve read that you can train a cat to go where you want to go by talking in a friendly voice and encouraging her to follow you. But I’ve never had much luck with that. If we’re going in the direction of a place where we won’t be welcome or the cat will be in danger, I pick her up, and we go another way. She usually finds something just as interesting, and we’re off and running again. But first, she’ll stop and sniff the air to see if there’s anything interesting nearby. Or she’ll stare at something only cats can see while I try to figure out what it is. Inside, cats live in our world. Outside, they invite us into theirs. 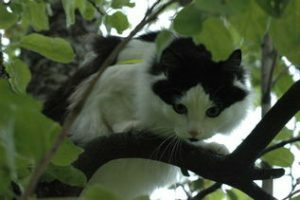 Being outside and walking on the wild side with your cat can be an almost magical experience. But you do want to keep her safe. If you haven’t done this already, get her microchipped before you go out. Make sure her harness fits her snuggly so she can’t wiggle out of it. You should be able to fit just one finger between the harness and the cat. Stay behind her rather than walking in front of her. If you’re behind her, it will be almost impossible for her to pull out of the harness. Never pull on the leash or force her to go where you want her to go. Remember, you’re visiting her world now. Let her lead the way. And if you pull on the leash, the buckles of the harness could come undone. If she does get away from you, don’t run after her. That will just scare her. And she can outrun you, even if she’s dragging a leash behind her. Instead, walk after her very quietly and slowly. When you get close enough, step on the leash before you bend down to pick it up. Or sit on the ground and wait for her to finish exploring and come back to you. She’ll need some treats!